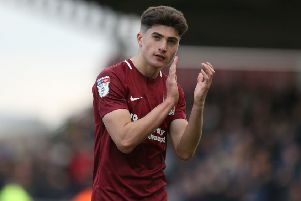 Timi Elsnik can’t wait to get started in a Cobblers shirt after signing on loan from Sky Bet Championship outfit Derby County for the rest of the season. The 20-year-old completed his move to the PTS Academy Stadium on Friday lunchtime, and by mid-afternoon was training with his new team-mates ahead of league two clash with Morecambe (ko 2pm). The attacking central midfielder, who hails from Zlatoličje in Slovenia, has spent the first half of the current campaign with Town’s league two rivals Mansfield Town, but had his season-long loan there cut short two weeks ago. Keen to get out playing again rather than returning to Under-23s football with the Rams, Elsnik was quick to answer the call once he heard of the interest of Keith Curle and the Cobblers. “It was really good at Mansfield and it was supposed to be a season-long loan, but then the clubs had a little bit of a disagreement and Derby recalled me,” revealed Elsnik. “That meant I was a free player, and Northampton came and grabbed me, at that is why I am here. “The main reason I have come here is to get game time, and I want to play as many times as possible between now and the end of the season and help this team climb the table. “I had a few chats with the gaffer, he called me and he impressed me, and I am happy I am here. “He told me about the team and the way they play, the way he sees the future of the club and how I would fit in. “The way he explained things to me, that is my favourite position, I like to play as an attacking midfielder and close to the goal, because then I can create, I can score goals and help the team that way. So what sort of player can the Cobblers fans expect to see? “I am like a number eight, a box-to-box midfielder,” said Elsnik, who has played for Slovenia at Under-17, U18 and U19 level. “When I get the ball I like to drive forward and create chances, shoot, and score goals. “That is my favourite position, but I have played a lot as holding midfielder as well, especially in academy games as I was one of the bigger boys. Travelling Town fans may well have already seen Elsnik at his driving best, as he was on target against the Cobblers in Mansfield’s 4-0 league two victory over Town back in September. Picking up the ball on the edge of his own area after a Cobblers corner was cleared, Elsnik ran the length of the pitch unchallenged down the left wing, before unleashing a vicious cross shot that arrowed past David Cornell and into the corner of the net. Town fans would love to see him do the same with a claret shirt on, and the youngster says he will certainly be doing what he can. “Any team you play for, you have to give your best,” said Elsnik, who also spent last season on loan in league two, playing for Swindon Town. “So I am here now, and I am looking forward to playing for Northampton. “The first training session is done and on first impression it is a really good group of guys. “Now I am going to give everything for the club, and hopefully put in good performances for Northampton. And it is also clear from talking to Elsnik that those chats with Curle have registered. The Town boss has spoken a lot recently about working with other people’s jigsaws and putting all the pieces together, which is he is now starting to do. And Elsnik added: “It is a really good environment I have walked into.